Let’s see what the Munchpak June box brings to the table. In case you’re new to the blog or Munchpak AKA “The world’s best International food subscription box”. They deliver an assortment of mouth-watering snacks from around the world to your door as often as you like. From sweets to savory foreign treats you can even customize your package by selecting your preferred snack types, which makes this option a great gift idea for just about anyone. They have a first of its kind Snack Scanner app available for iOS and Android which allows you to scan the barcode of any snack you receive in your MunchPak. You can learn more about what they are, the country they’re from, save to your favorites, and purchase them at any time. Before we dig in, I reviewed last November’s box (linked here) and I wanted to especially thank Nick for hand packing my MunchPak all the way from Arizona! Cheers! Country: United Kingdom. A chewy heavenly treat. Warm it up in your mouth before chewing! Country: Germany. A healthy and appetizing cereal bar, perfect for those of us who are always on the go! Country: United Kingdom. Delectable waffles with a soft toffee centre, that can be eaten warm or cold. Country: United States. A unique sweet, sour and spicy flavour all in one. Country: Turkey. Colourful fun sour flavoured candy. Country: United States. Roasted by Real Monks in the Rocky Mountains. The cowboy blend has notes of cocoa, caramel, vanilla and a hint of aromatic herbs. Country: Canada. Maple and bacon in chips… need I say more? Flavorful sweet and smoky seasoned crispy chips in perfect harmony! Country: China. Scrumptious crispy wafer cookies filled with a chocolate cream center. Country: South Korea. These are cute koala shaped, bite-sized cookie shells with a sweet chocolatey creamy texture. I hope you have enjoyed this unboxing, click here to find out more about MunchPak. Omg the maple bacon chips sound so bloody good!!! Hmm that Corny Big Multi-Grain Bar Chocolate Banana looks delicious… and healthy – yay! I’ve had the Lotte Koala March cookies before – they are YUM. Woohoo, Maple Bacon chips – Canada represent! I have never heard of this before but I think it may just be the best subscription box I have ever seen! 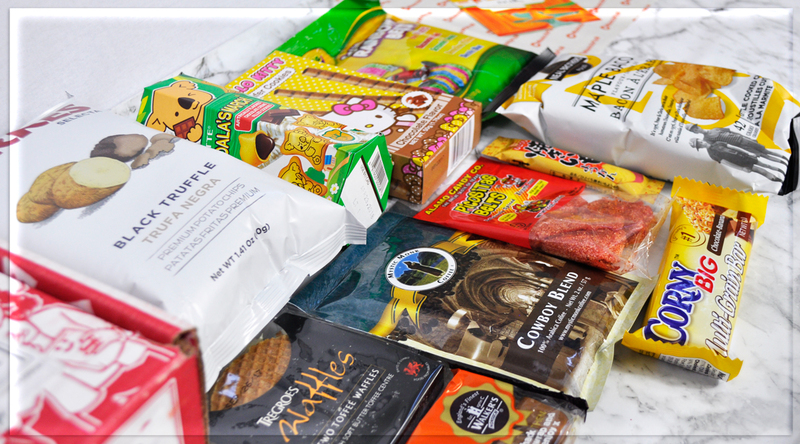 I love trying new snacks especially travelling, but this brings them all to your door! Love it! All of these look so good!!! My mouth was literally watering reading this post! I’ve actually never heard of this box but it’s such a cool idea! And omg that first toffee would be perfect for me…I’m obsessed with anything caramel/toffee! So yum! But nothing from India 🙁 If you do like spicy food, I highly recommend that you try the Lay’s Indian Magic Masala chips.